In this kind of hot weather I hardly want to turn on my oven to bake anything. The hot oven will warm up the house as I tried so hard to keep it cool. Since the weather is much cooler today I thought I should bake something. I have some leftover cinnamon raisins bread in the fridge so I figured out making some bread pudding should be a good way to finish it up. I don't have any berries in my fridge so I add some bananas to it. 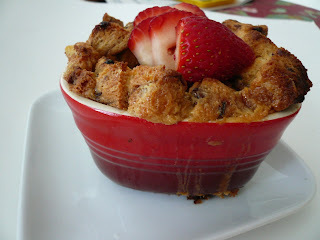 Bread pudding can be whip up in a flash especially if you have surprise guests at your home. 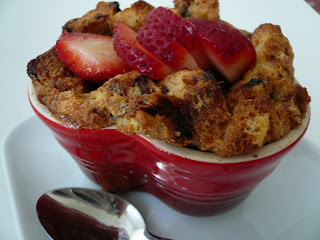 Bread pudding can be serve warm or cold by itself or with some cream and fresh fruits. Cut bread into 1/2" cubes. 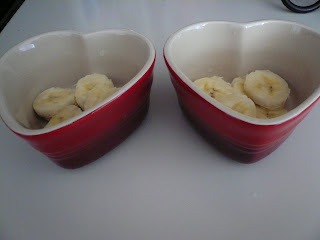 Cut banana and arrange it on the bottom of ramekins. Put the cut bread in the ramekins. Mix eggs, sugar, milk, cinnamon and orange zest in a mixing bowl. Pour over bread and let it soak for half and hour. Bake in the pre-heated 325 degree F oven for approx. 35-40 min or until the custard is cooked. 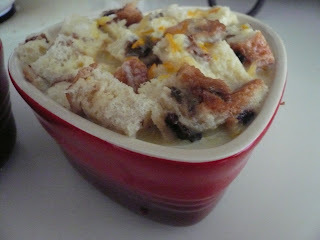 Gert, ur bread & butter pudding look so good. mine turned out to be too sweet and soggy. looking at ur bowl, iv got to get small sizes so tht i dontv to make big portion everytime i wanna make something. look at ur recipe, can i steam it instead of bake it?